The feet are especially susceptible to toenail fungus because shoes and socks create the ideal dark and moist environment that fungal infections thrive in. While fungal infections of the nail plate are quite common, fungi can be harmful once they have invaded past the skin and more serious infections can spread beyond the feet. 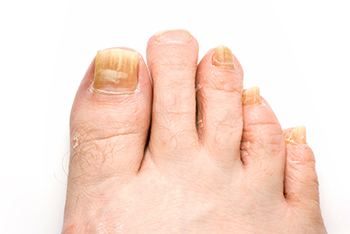 Signs of toenail fungus include a thickened nail that has become yellow or brown in color, a foul smell, and most debris beneath the nail. The toe may become painful due to the pressure of a thicker nail or the buildup of debris. Treatment for toenail fungus is most effective during the early stages of an infection. If there is an accumulation of debris beneath the nail plate, an ingrown nail or a more serious infection can occur. While each treatment varies between patients, your podiatrist may prescribe you oral medications, topical liquids and creams, or another therapy. To determine the best treatment process for you, be sure to visit your podiatrist at the first signs of toenail fungus.